The Dalton Highway runs for 414 miles between Fairbanks, Alaska and the Prud- hoe Bay oil field near the Arctic Ocean. The highway runs parallel to the Trans-Alas- kan Pipeline System, and is essential to the trucking industry, hauling critical sup- plies (including food, housing, tools, and equipment) to the oil fields near the Arctic. Along this 414 mile stretch of road, there are only three service stations among the treacherous landscape, and drivers are warned to be well prepared to make the long haul on this roadway. Portions of the gravel road are sometimes closed due to zero visibility, inclement weather, enormous potholes, erosion and extreme weather. This roadway is featured in the TV show series Ice Road Truckers that showcases the struggles that drivers face due to the treacherous road conditions. Few roads in the world offer the degree of isolation that the Dalton Highway offers. GeoNorth Information Systems has the unique ability to collect, downlink and deliver both optical and radar imagery in just a few hours to clients who need imagery for disaster and risk management needs. GeoNorth Information System's multi-sat capability enables them to have access to task and downlink directly from Airbus DS optical and radar satellites. GeoNorth Information Systems currently has access to Pleiades (50cm), SPOT 6/7 (1.5m), as well as TerraSAR-X (25cm – 40m) satellites. ‘seeing through’ clouds, which is tremendously advantageous where weather conditions are constantly changing. The Northern Slope of the Dalton Highway was experiencing high winds, blowing and drifting snow, and zero visibility. Additionally, TerraSAR-X imagery is ideal for discriminating standing water (or smooth ice) from shifting river ice, which was instrumental in helping AKDOT & PF in their assessment needs. After assessment of the customer need, area of acquisition, and type of imagery, GeoNorth Information Systems tasked TerraSAR-X and was able to downlink, collect and delivery a 1.25m StripMap image to AKDOT & PF in less than 18 hours of the origi- nal request. AKDOT & PF immediately used the radar image to assess the flooding impact along the Highway, in particular to identify washed road or iced sections. Pléiades (50cm) and SPOT 6/7 imagery was also delivered to help validate and confirm details of the flooded area. 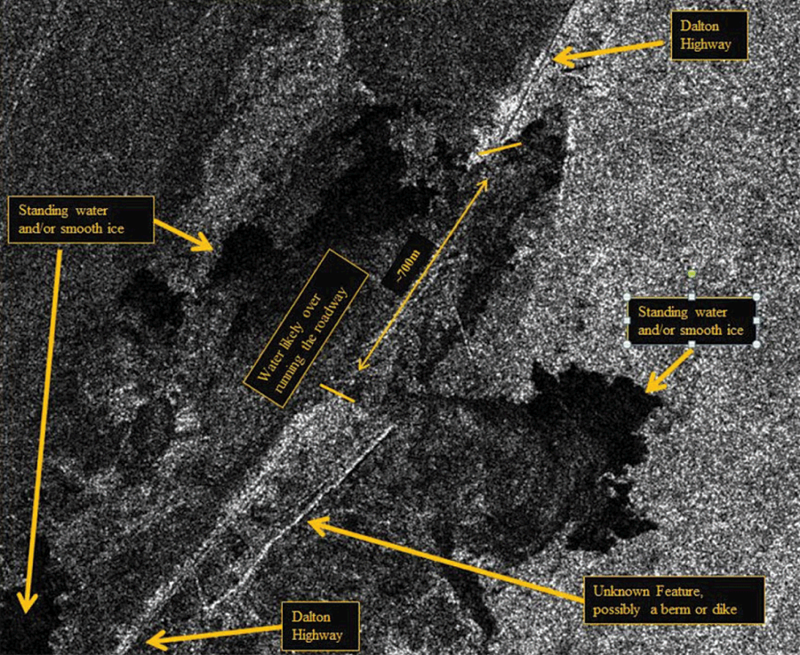 The image above shows some of the analysis on the portion of the highway that was flooded. The rapid acquisition and delivery of optical and radar imagery allowed AKDOT and PF to remotely assess the damage and best course of action along the flooded Dalton Highway within a few hours after the original request. Using the TerraSAR-X weather independent satellite, GeoNorth Information Systems enabled AKDOT and PF to quickly access important information for deci- sion-making, despite bad weather conditions. The regular monitoring of the area and the fast delivery of the images helped to get access to important information in near real-time. Given the persistent winter storms in the region, the AKDOT and PF utilize the combi- nation of high resolution optical (Pléiades and SPOT 6&7) and radar (TerraSAR–X) satellites to acquire high-resolution images regardless of the weather conditions. By utilizing GeoNorth Information Systems' Direct Receiving station, the AKDOT and PF was able to acquire imagery over the flooded road surface every two days within 30 minutes of collection. This data provided by GeoNorth Information Systems to the AKDOT and PF allowed emergency crews to accurately monitor ongoing flooding in the region and identify breaches to the roadway in order to support emergency repairs and quickly open this vital economic corridor.